Basically this guide is intended to be a quick reference to the relatively new users who are not easy with using find, locate, du combined with sed, awk, head, tail, unix pipes to find and locate files with some conditions. We can use other GNU tools. We can really extract huge information from log files like we have shown on our guides to check Fail2Ban log (we have a bash script for Fail2Ban log checking derived from it), Apache2 log checking etc. 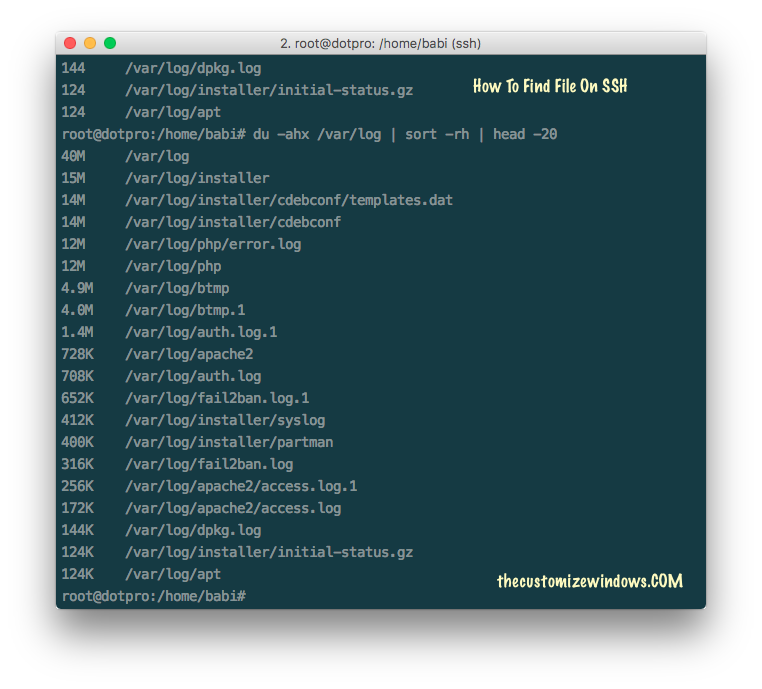 Here is a guide with examples on how to find file on SSH as not always checking log is the thing we need to search. UNIX, Linux systems are matter of how you can use the tools. This Article Has Been Shared 4006 Times! Cite this article as: Abhishek Ghosh, "How To Find File On SSH : Examples With Log Files With Conditions," in The Customize Windows, July 27, 2017, April 21, 2019, https://thecustomizewindows.com/2017/07/find-file-ssh-examples-log-files-conditions/.